IT’S NEVER TOO LATE TO JOIN THE CIRCUS! 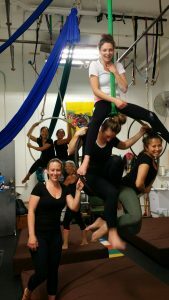 Fun, progressive, aerialist fitness class for women and men of all shapes and sizes. The classes are organized from beginner to more advanced movement on the ground before moving to the air in a safe progression with a focus on injury prevention. Fly With Me is an aerial fitness training studio located in Toronto. Founded by Diane McGrath Lokos in September 2012. After performing for seventeen years as an Aerialist with various Troupes, Dilorus Productions, Vertical Travelers, ZeroGravity, Gravity Works, Diane Mcgrath decided to turn her focus on coaching. Fun, progressive, Adult Aerial fitness classes for women and men of all shapes and sizes. Classes offered for all age groups. No experience required. Fly With Me has grown since 2012 now offering 9 different classes and hosting creative workshops for the students and the Aerial community to further there education. Prepare to be fit and fabulous with an extraordinary fitness class that will leave you feeling exhilarated and empowered. Each class is taught by a professional aerialist. You will strengthen your body, learning movements that shape the fundamentals for performing more complex sequences on trapeze, silks, rope and hoop. Diane also has a private studio in the Roncesvalles Village as well, an outdoor 19' rig for private and semi private class at her home. Diane has performed for seventeen years as an aerialist with Dilorus Productions, Vertical Travelers, ZeroGravity, Gravity Works.